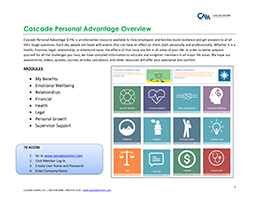 Note: To access Cascade Personal Advantage, your employer needs to have this enhanced service as a benefit for employees. For more information please call Cascade EAP at 800–433–2320. 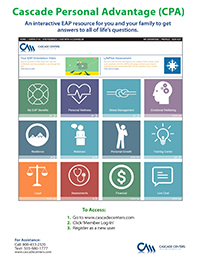 Cascade Personal Advantage is a resource to help employees and families manage the stress we all experience with innovative, online educational tools. With information about work, life, and health in an easy to navigate website, everyone is sure to find information to help make life easier. Innovative, online, educational tools: Kick a habit, get financial or legal help, compare child and elder care services, watch informative video clips and more. Drawing from world–class contributors such as Harvard Medical School, Nolo Legal Press, and FinanCenter, Cascade Personal Advantage aggregates more than 10,000 resources into an easy–to–use website. Training 45 interactive training courses and 400 articles for topics such as Business Management, Human Resources, Team Building, Communication and more. At the end of the course, a certificate of completion with the trainee's name is provided.